Video: How-to-roast Ginkgo nuts (seeds) presented by a class of Korean first-year high school students practicing their English skills. Most Japanese and Koreans roast Ginkgo nuts in this way at home or at food stands. Video on YouTube by ilovesheenaeaston. Art in the Making: Under the Ginkgo Tree. 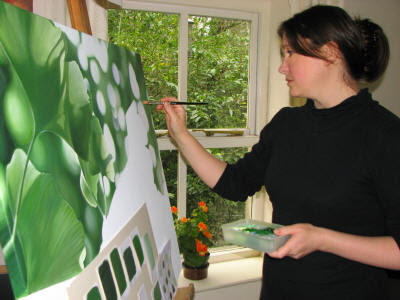 Artist Tracey Jayne Thomas shows us how she paints Ginkgo leaves. Read full article with many photos here. This article appeared in the International Artist Magazine, August/Sept. 2009 Edition. 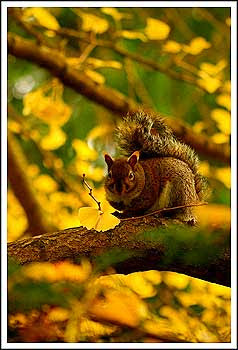 Lovely photo of a squirrel sitting on a branch of a Ginkgo tree in San Francisco, California, USA. Photo by Doubletee on Flickr. * Section Videos - Photos on this Specials-page moved to my blog. * Added to my Art-page (picture gallery) Art Nouveau Ginkgo designs by Else Strauss. * Added to Tree-page video "Ginkgo in fall impressions". * New topic: Study: Ginkgo and cognitive decline in older adults. Chinese watercolor painting - Golden Carps on dried natural Ginkgo leaf. Chinese folk artists use small brushes to create flora, fauna and landscapes on small dried leaves. 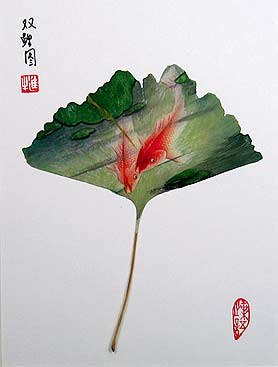 This leaf painting is given the title "Shuang Li Tu", in English "Image of Two Carps".